With summer just around the corner, it is becoming increasingly important to make sure that proper safety precautions are observed as the heat sets in. While it is obviously always important to make sure semis are properly taken care of, rising heat and more traffic on the roads makes summer an especially dangerous time for the trucking industry. While much of the information provided below may seem like common knowledge, it is always a good idea to stay knowledgeable whether you're a veteran trucker or making your first long haul in your entry-level trucking job. When most people think of preparing their truck for the coming weather for a specific season, winter usually comes to mind due to ice, snow, and overall cold conditions, like those found in Wisconsin. However, summer semi preparation is just as important as the truck and driver will soon face the opposite extreme of winter with hot and dry weather. Obviously with the hot weather, it is important to keep the truck, and the driver, cool, so extra precautions must be taken in order to make sure the cooling system of the semi is running in perfect condition. Experts have agreed that malfunctions within the cooling system are nearly 100 percent avoidable and can be prevented by regular throughout checks. This is increasingly important due to the fact that even a small problem with the cooling system can cause lasting damage to the semi - not to mention hamper the efforts of a driver in a regularly hot location such as Texas. To begin this check, it is important to start with the antifreeze, or coolant, concentration levels due to the fact that if the water level is even off by a little bit, the system will not function correctly, or even worse – fail all together. The color of coolant is also important, as it may hint to bigger problems if it is discolored, cloudy, or contains particulates. 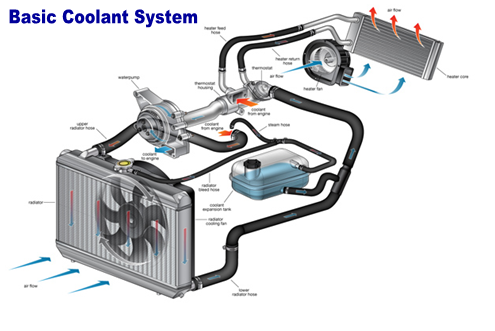 Coolant is obviously very important to maintain a well running truck, but it is also easy to forget that it must be checked every 500 hours the truck is in operation, 20,000 miles of driving, or every three months – whichever comes first. It is also incredibly important to check all parts of the cooling system for corrosion, debris, or damage, which includes the radiator mounts, fan shrouds, and fan clutch. While cleaning the fan clutch can be pretty touchy, it can also be simply accomplished by using a dry parts brush to remove any debris. Another important maintenance to the cooling system that should be completed in order to get trucks summer road ready is to pressure wash the radiator, charger air cooler, and the condenser from the engine side. While this may seem like a long and tedious project, it is really quite simple and should not take much time at all. The key is to work from the top of the components down to dislodge and bring down any sort of debris, rather than going from bottom to top and risking the chance of causing further dangerous clogs. The driver should also make sure to pay special attention to the upper and lower corners behind the fan shroud, as they often go overlooked. During this process, and any time when working with a pressure washer, one should pay special attention to making sure to not bend fan blades or damage cooling fins. While it is crucial to keep the semi itself cool, it is also important for the driver to stay cool during the hot summer months. There's nothing worse than being in a trucker job wherein one feels as though they are going to collapse due to the heat. This is why it is very necessary to make sure the air conditioning system itself is also in proper running condition. California drivers can attest to the potential heatwaves that plague them in the dog days of summer. One important thing to keep in mind, like with the cooling system, is that checking the air conditioning system, or heating system in the winter, should be done seasonally in order to prevent worse problems from occurring later down the road. Checking the air conditioning system is also a fairly simple procedure and will take very little time. First, and most simple, is to compare the noise the blower motor is producing in order to notice any change in sound as this will be the biggest indicator if the system needs replaced or not. Also, checking the hose for leaks and cracks are important, but a driver should also all hoses and fittings are tight and that bends and flex points are functioning correctly. It is also important to make sure that the condenser is clean and any debris that may be in there is removed. Not only will this keep the driver cooler, but it may possibly save on fuel costs or increase mileage as the condenser will not have to work as hard as it would if it were dirty. If there is debris and buildup in the condenser, the easiest way to deal with it is one of two ways, to flush it or replace it all together. Both of these options have one main advantage and one main disadvantage. While having the condenser replaced is incredibly simple, it can also be very expensive. On the other hand, while flushing out the condenser is much more cost effective, it can also make the risk of failure higher or cause blockage elsewhere if everything is not removed from the condenser. On the note of blockage, one should also check the filters to ensure they are also clean and free of debris. Whether or not drivers or mechanics should clean air filters is actually a tough subject within the trucking industry. On one side, many filter manufacturers refuse to warrant cleaned filters, but on the other side many argue the fact that cleaning the filters lowers operating costs. This is why it is important to check with manufacturers and maintenance supervisors before personally taking action on an air filter. If it is found to be plugged, immediately contact maintenance in order to decide what steps should be taken next. While under the engine, one should also do a quick check of the semi's belts. This should take hardly any time at all due to the fact that just a simple, visual inspection will show if belts need to be tightened or replaced. Over the spring season, temperatures have a tendency to fluctuate often and that, along with regular vibration from the truck and various conditions of the road, may have caused the belts to wear down or even start to fray or become misaligned. If a driver is unaware of telling the proper tension of a belt, there are products such as the automatic tensioner available on the market. 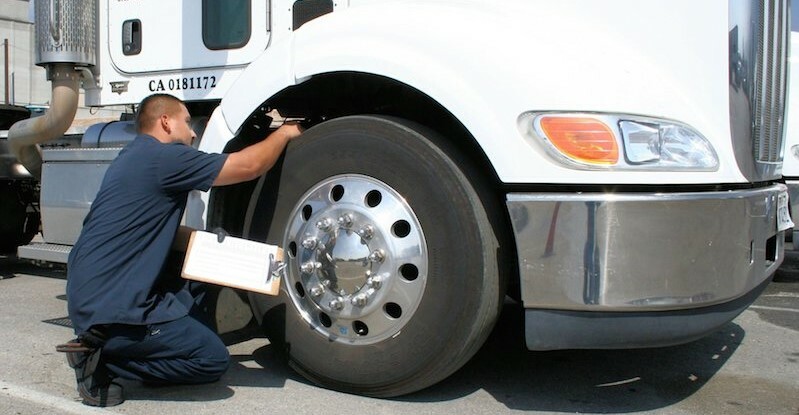 Taking precautions and checking the engine routinely will no doubt help a semi run properly, but another large component of summer safety are the tires. With so many tires, it is necessary to check them all periodically for the safest and smoothest haul. Easily, the most crucial point of the tire inspection, is to make sure all tires have the correct pressure because without it, tires will not have proper and even contact with the road. Pressure also improves the traction and braking of the vehicle and prolongs the life of a tire, saving both time and money While this is usually something many drivers think is most critical to check after winter due to the fact cold air decreases tire pressure, the continuing fluctuating temperatures of spring can still change tire pressure. During summer months, especially in areas where humidity runs rampant and weather changes such as Florida, it is also important to keep an eye on the pressure and make sure it matches what is needed for the load, because road heat alongside over or under inflated tires makes it more likely for a blowout to occur. Along the same lines of weather related changes to tires, this is also an ideal time to look for any cracking or strange wear the tires may have suffered. This also becomes increasingly important as hot roads and overall heat will cause the rubber of the tire to break down faster. To make sure they are in proper condition, a driver should check the tread depth to insure there is the correct amount to compensate for the position of the wheel. This can be easily done with a tread gauge. The sidewall should also be carefully looked at for any exposed belt or ply material, as this makes driving conditions dangerous. While looking at the tires, it is also the perfect time to look inside and between dual tires and see if there is any debris. If there is, simply clean it out. Also, a driver notices uneven wear on the tires, it may be time to have the truck realigned. Wheels should also be checked during this time for any possible cracks or loose lug nuts. Though there are many tires, each one is needed to make sure the driver and cargo gets where it needs to be. Again, these may be obvious tips anyone with a truck driving job knows by heart, but like with so many things in life, the basics often slip to the back of the mind. Having a quick refresher on the basic seasonal check up of trucks ensures for a safe and productive summer.